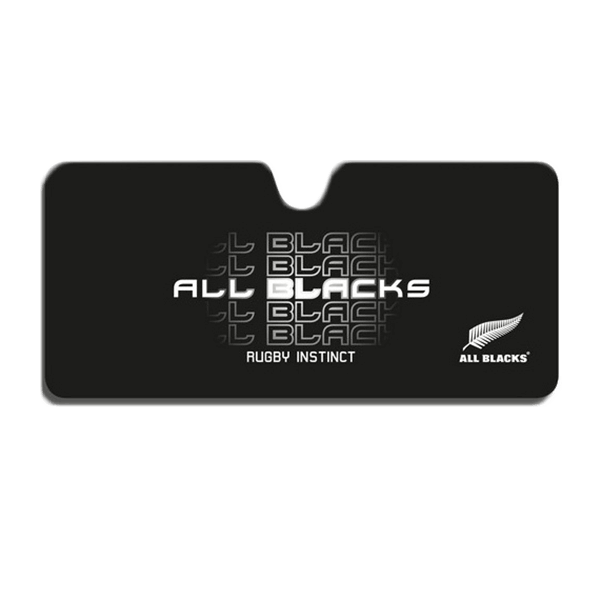 Show your support for the All Blacks even while driving! 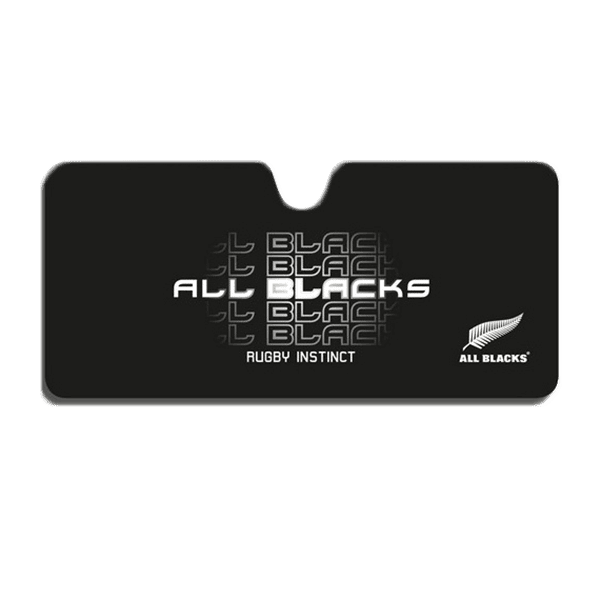 Shade your eyes from the sun with the All Blacks Car Sunshade. Orders are processed 7 days a week, with the exclusion of New Zealand public holidays. For orders placed and processed on the weekend, you will receive a completed order notification, however your item will not ship from our warehouse until Monday. Flat Rate – (New Zealand Only) Tracked signature required delivery option. eParcel Express – (Australia Only) Tracked Signature Required, with authority to leave parcel without signature if delivery location is safe and secure. International Air – A non-tracked freight option. No tracking or delivery updates are available. For packages up to 2kg, with an order value no greater than $250. Delivery is only available to select countries. International Air Satchel Tracked – Tracking updates at picked up, processed, and delivered. Available for packages up to 2kg, with an order value no greater than $250. Delivery is only available to select countries. International Economy Courier – Signature required delivery with full tracking updates. Delivery time of 2-6 working days. International Express Courier – Signature required delivery with full tracking updates. Delivery time of 1-5 working days. 1-2 working days delivery time to most areas. Rural deliveries occur an additional 1-2 working days delivery time. Courier Post can deliver to P.O Boxes across New Zealand. New Zealand Post International Air Satchel Tracked. Flat rate of $10 up to 1kg. 4-10 working days delivery time. Australia Post eParcel Express. Starting rate of $15 up to 1kg. Delivery target of 2-4 working days for major cities (BRISBANE, SYD, MEL, PERTH) all other areas an additional 1-3 working days. Australia Post eParcel Express is a direct entry service to Australia. Customers can take control over the delivery of their goods using the AusPost MyPost Services. eParcel is a tracked service, and can be delivered to P.O Boxes and Rural Australian addresses. Please note this service is only available for orders under $1000. New Zealand Post International Air Satchel Tracked. Flate rate of $10 up to 500g. 6-10 working days delivery time. New Zealand Post Economy Courier and Express Courier are also available to Japan. See pricing below. New Zealand Post International Air (non-track-able). Starting rate between $9.50 and $12.20 up to 500g. 8-16 days working delivery time. New Zealand Post International Air Satchel Tracked. Starting rate between $13 and $22.25 up to 500g. 8-16 days working delivery time. New Zealand Post Economy Courier. Starting rate between $36.80 and $40.15 up to 500g. 2-6 days working delivery time. New Zealand Post Express Courier. Starting rate between $70.70 and $93.25 up to 500g. 1-5 days working delivery time. Please note Express Courier cannot deliver to P.O Boxes. Every order will be given a delivery tracking number, which will be included with your order dispatch email. Please note International Air is a non-track-able freight option, the only update you will receive is when your order is dispatched. For further detailed information on shipping options and delivery charges please refer to our shipping information page. Sign up for exclusive offers & promotions!